Combined with the integrity of the equipment and the integrity of the filtration, Alpine® implements, mandates and enforces thorough guidelines for all employees and dealers who are working directly under the Alpine® National Partnership Program. These certifications are backed by International Business Development, Inc. under our Clean and Green® seal bringing integrity to our service. Entire System Flushing with bleach. Although systems with In-tank UV are very effective in maintaining a sanitized reservoir. 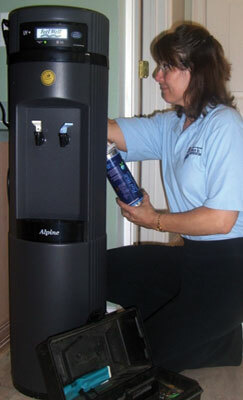 Each water system needs to be thoroughly sanitized on an annual basis. If no in-tank UV is used then semi annual sanitization is recommended.